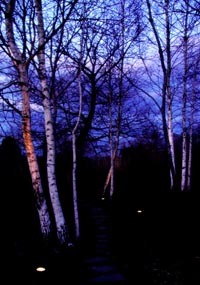 Landscape Lighting can have a dramatic effect on your landscape. In addition to providing safety and security benefits, a good lighting design and installation can create moods that are soft and subtle, dramatic and dynamic. Lighting can highlight features of structures, plants and the property. It can make outdoor spaces usable at night while adding a magical view when viewed from inside your home. Our low-voltage systems not only save on your energy bill, but the quality of light surpasses that of an ordinary 110 voltage system.